Thatchers Cider has introduced new, lighter weight cans for its cider, meaning the Somerset cidermaker is saving the equivalent of 5.9 million empty cans a year. The latest in a string of sustainability initiatives being implemented by Thatchers, this change will see around 70 tons of aluminium saved each year, thanks to switching to Ardagh Group’s lighter weight beverage cans. Thatchers Cider expects to save approximately 381 tons CO2 in 2019 by using only the lighter weight can. Thatchers was the first cidermaker to ditch plastic ring carriers on its four-pack of cans, introducing instead recyclable board outers. Martin Thatcher, fourth generation cidermaker said, “We’re looking at many different ways of reducing our impact on the environment. As well as running a business, we are all, as individuals, passionate about cutting waste and doing our bit to bring about change. Lightweighting our cans means less energy used across the packaging process. “We’re producing around 100 million cans a year at Myrtle Farm, so this initiative will make a big impact. “Investing in sustainability is one of our key priorities. However, it’s equally important to retain quality, ensuring that the durability of the new lighter cans is not affected. So the Ardagh Group worked hard to get the weight exactly right”. 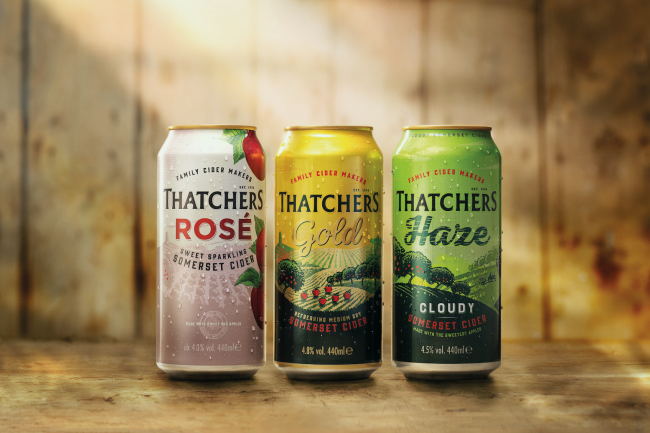 Thatchers produces its family favourites range of ciders in cans – namely Thatchers Gold, Haze and Rosé. Throughout the cider market cans continue to be hugely important, driving market growth with a 52.5% share (Total Cider & Perry volume IRi 52w/e 2nd March 2019). Thatchers flagship cider, Thatchers Gold, is the number 2 canned apple cider in the UK, and is enjoying continued growth in shopper numbers.